(S-M) Men 1980's Cosby Ski-Sweater! Dark Blue, White, Black, Diamonds, Triangles Fun! 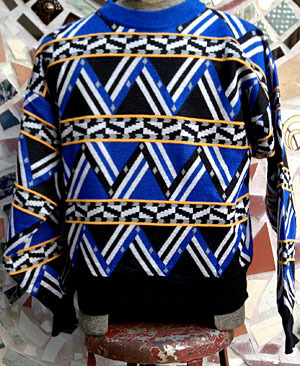 Home > Men's Vintage Shirts > Sweaters and Cardigans > (S-M) Men 1980's Cosby Ski-Sweater! Dark Blue, White, Black, Diamonds, Triangles Fun! 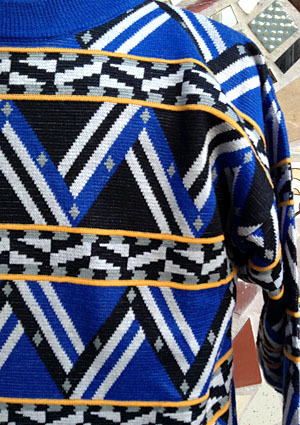 Vintage 1980's COSBY Ski-Sweater! Bold tones of Dark Blue, Black, White, and Gray in a fun geometric pattern of jagged lines, Diamonds, Rectangles and Triangles. Feels like it would block the wind really well! Pattern runs front, back, and sleeves. Ribbed Collar, Cuffs and Hem. Tagged by Obermeyer. No material tag, but feels like 100% Cotton.